Just a very quick post to point you towards something I recently came across through the power of Twitter – plagtracker.com. This is an online service which will scan a block of text (i.e. an essay/paper) and compare it to internet pages and a database of academic papers. The best thing about it though, is that it’s completely free! Pretty cool. 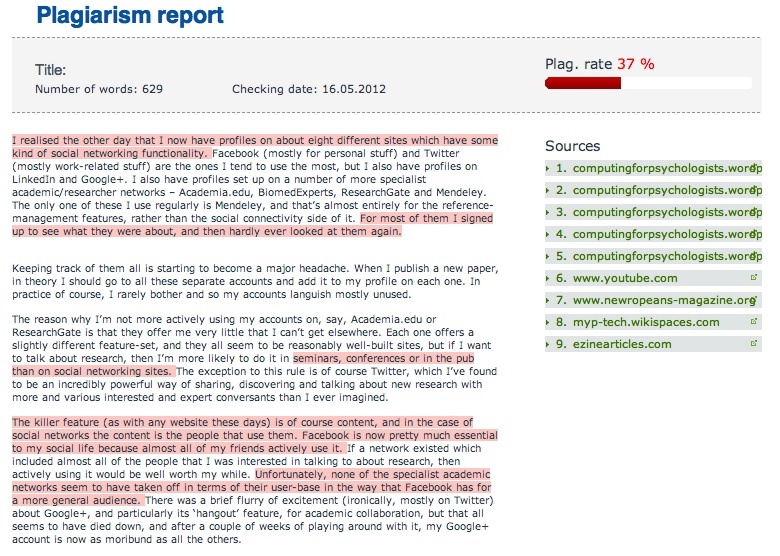 The web interface means it probably isn’t that useful for essay-markers who want to batch-check a whole load of student essays, but if I was a student, I would definitely be using this service to check my essays before submission – plagiarism can happen by accident after all, and can often be fixed by just citing the correct sources. I say ‘often’ because you still have to remember the golden rule of undergraduate essays – for the love of God, don’t cite Wikipedia as a source! The absolute worst experience for any educational professional is to sit down on an evening or a weekend (it always seems to be an evening or weekend, when you should be doing something more enjoyable) with 100 essays or exam scripts, all on the same topic, and slowly, resentfully, plod your way through and grade them. It’s hell. At times like that I would have been willing to cut off a finger if somebody could have showed me a way that they could all be marked automatically. The student essay as an assessment technique – an obsolete technology? This post is a bit of a diversion from normal service, but it’s been inspired by some things I’ve been reading recently on essays (or ‘papers’ for my North American readers) and student assessment. The first was this piece on plagiarism and essay-mills, and the second was this piece here. Both highlight some current issues with assessment methods at university/college level, such as plagiarism, something which I’ve also covered before. So anyway, in keeping (vaguely) with the theme of this blog I thought I’d take a look at the essay/paper as a technique (or ‘technology’ if you will – see what I did there?) for educational assessment and try and determine whether it’s still up-to-date, or as obsolete as a 5-inch floppy disk. Or a 28.8K modem. Or leaving your goddam twitter account alone for five minutes and giving someone your undivided attention during a social interaction. You get the idea.